Atlantean warrior figures, c. 900–1000 CE. Stone. Temple of the Morning Star (Tula, Mexico). Average height approx. 15′ (4.5 m). 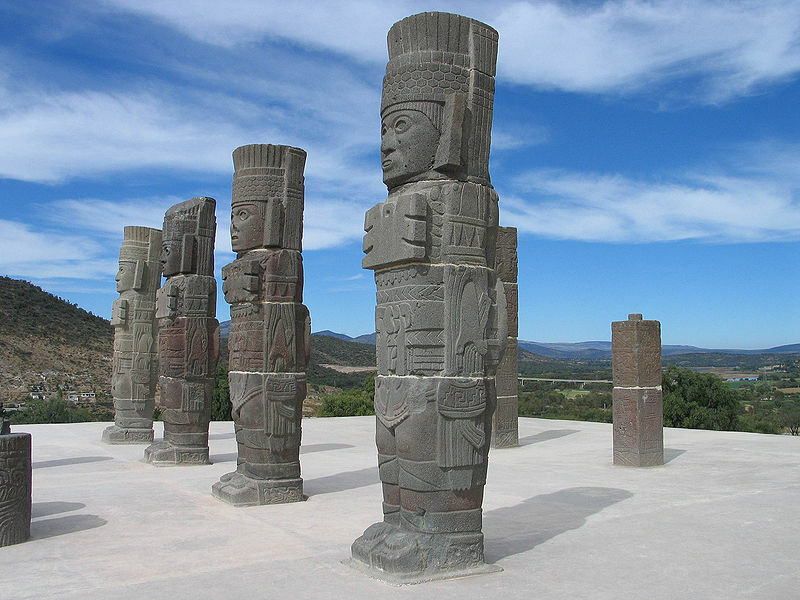 You can get a sense of scale for the Toltec statues here. Moai figures, Ahu Nau Nau, Easter Island, Polynesia, c. 1000–1500 CE. Volcanic stone. Average height approx 36′ (11 m). I also see some similarity in the frontal, rigid stances for both these sculptural groups. The linear arrangement of the statues is also similar, although that similarity more easily observed today since the warrior figures no longer function as columns. It’s interesting to see how a few similarities were appearing at the same time across the world. Perhaps we could chalk up these similarities to Hegel and his Geist theory? I have been doing some research on Isabella Stewart Gardner over the past few weeks, in hopes to present something at a conference this fall. In doing this research, I’ve started to make a compilation of “collection museums” that were created by private collectors in the late 19th and early-to-mid 20th century. I love going to “collection museums,” especially when such buildings also functioned as the residence for the collector. Two of my favorite museum experiences are when I visited the Phillips Collection in Washington, DC (shown right) and visited the Frick Collection (shown below on left). I think that a museum visitor can make a lot of interesting associations with works of art when they are in such a personal, domestic setting. Although great works of art can undoubtedly stand (or hang!) on their own, I love seeing works of art in an interesting context and display. “Collector museums” are fun to have in a postmodern society, don’t you think? It’s much more interesting to me than the white cube gallery space, that’s for sure. UPDATE: A more comprehensive list (going outside the time frame from this post) was created in a separate post on this blog. The Wallace Collection (London). The collection was mainly amassed by Richard Seymoure-Conway, who bequeathed the collection to his illigetimate son, Sir Richard Wallace. Collection is displayed in the Hertford House, the main London townhouse of Sir Richard Wallace. The collection was bequeathed to the British nation in 1897 by Lady Wallace (Julie-Amélie-Charlotte Castelnau), wife of Sir Richard Wallace. The Isabella Stewart Gardner Museum (Boston, Massachusetts). Collection of Isabella Stewart Gardner. The museum (“Fenway Court”) also served as Isabella’s residence. Construction begun in 1899, opened to the public on Near Year’s Day, 1903. Jacquemart-André Museum (Paris). Collection of André and Nélie Jacquemart. Nélie Jacquemart was a well known society painter. In accordance with her husband’s wishes, Nélie bequeathed the mansion and collection to the Institut de France. Museum opened in 1913. The Hallwyl Museum (Stockholm). Primarily the collection of Countess Wilhelmina von Hallwyl. Museum is located in the Hallwyl House, which served as the private residence for Count and Countess van Hallwyl. Collection was donated to the state in 1920. The Phillips Collection (Washington, DC). Collection of Duncan Phillips. Museum building was once Phillip’s residence. Founded 1921. Sinebrychoff Art Museum (Helsinki, Finland). Collection of Paul Sinebrychoff. Collection donated to the state in 1921. The Sinebrychoff private residence (the current location of the museum) was bequeathed to the state in 1975. The Barnes Foundation (originally located in Merion, Pennsylvania). Collection of Albert C. Barnes. Founded in 1922. I’m especially distraught over this museum, since the collection is currently being moved to a new location in Philadelphia. If you want to learn more about the situation involving the displacement of the Barnes Foundation, I’d recommend that you see the documentary The Art of the Steal. Freer Gallery of Art (Washington, DC). Collection of Charles Lang Freer. Construction begun in 1916, but gallery completion was delayed because of WWI. Gallery opened in 1926. Benaki Museum (Athens). Collections of Antonis Benakis. Founded in 1926. The Huntington Art Gallery (Pasadena, CA). Collection of Henry E. Huntington. Museum building was once Huntington’s residence. Opened in 1928. Musée Marmottan Monet (Paris). Originally the collection of Paul Marmottan (which was partially inherited from his father, Christophe Edmond Kellermann, Duke of Valmy). Museum was bequeathed to the Académie des Beaux Arts. The museum location originally served as the hunting lodge for Christophe Edmond Kellermann and later the home of Paul Marmottan. The Academy opened the museum in 1935. Museum collection was expanded with a gift in 1957 (Impressionist collection once owned by Doctor Georges de Bellio) and in 1966 (the personal collection of Claude Monet, bequeathed by Monet’s son Michel Monet). Museum also houses a collection of illuminated manuscripts once owned by Daniel Wildenstein (who died in 2001). The Frick Collection (New York City). Collection of Henry Clay Frick. Museum is housed in the former home of Henry Clay Frick. Museum opened to the public in 1935. The John and Mable Ringling Museum of Art (Sarasota, Florida). Collection of John and Mable Ringling. Museum functioned as the Ringling family’s private residence. Art collection, mansion, and estate were bequeathed to the state of Florida in 1936, at the death of John Ringling. This museum boasts an eclectic Baroque collection, among other things. Maryhill Museum of Art (Goldendale, Washington). Collection of Sam Hill and Loïe Fuller. Construction of mansion (current location of museum) was begun in 1914 by owner Sam Hill. However, construction stopped in 1917. Work resumed in 1920s and 1930s, with the intent of turning the mansion into a museum. Museum opened to the public in 1940. This museum owns more than 80 works by Rodin. Dumbarton Oaks (Washington DC). Collection of Mildred and Robert Woods Bliss. Museum also functioned as residence for the Bliss family. Institution dedicated and transferred to Harvard University in 1940. Know any more to add to this list? Have you been to visit any of these places? What was your experience? I learned about several of these lesser-known museums from a book review of A Museum of One’s Own by Anne Higonnet. I hope to read Higgonet’s book this week and add more museums to my list. I think it’s really interesting that several women were among the first to convert their private residence into a museum space, including Lady Wallace (Wallace Collection) and Isabella Stewart Gardner. Many other women were key in forming collections, such as the Countess Wilhelmina van Hallwyl (Hallwyl Museum) and Loïe Fuller (Maryhill Museum of Art). Perhaps there was something about displaying art in a domestic space that was especially appealing to female collectors? I think that I might explore this idea further in my research! This afternoon I’ve been thinking about Angelica Kauffmann’s painting, Self-Portrait Hesitating between the Arts of Music and Painting (1791, shown left). I can relate to this painting quite well: during my first year and a half as an undergraduate, I couldn’t decide whether to major in music or art history. I play the piano and studied classical voice for several years. At the beginning of college I continually felt compelled to study vocal performance, music education or choral conducting. In some ways, I still wish that I had kept up with my classical singing, especially when I listen to singers like Renée Fleming or Patricia Petibon (the latter is a recent discovery – she’s fantastic!). In the end, though, I decided to major in art history and minor in music. With only a minor in music, I felt like I could still learn and refine my singing skills but remain somewhat distant from the discipline. I’ve found that my enjoyment of music lessens if I focus on theory and technique too much; I end up overanalyzing musical scores and critiquing performances instead of just listening. However, my enjoyment and love for art (and art history!) doesn’t ever seem to go away, despite how much I learn or how critically I think. So, in the end, I art history was the best choice for me. Not only do I love this painting because I relate to Kauffmann’s interest in music and art, but I also love the idea behind the painting’s composition. 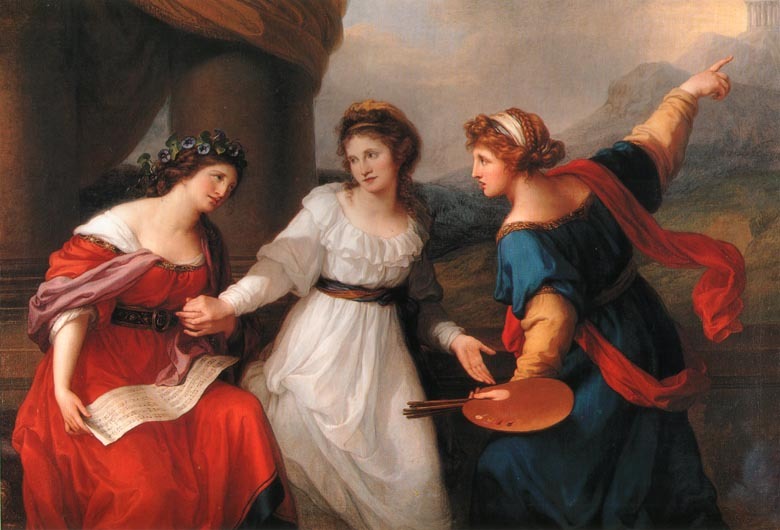 Here, Kauffmann is shown in an empowering position between the two arts: she has the ability to choose either career path. 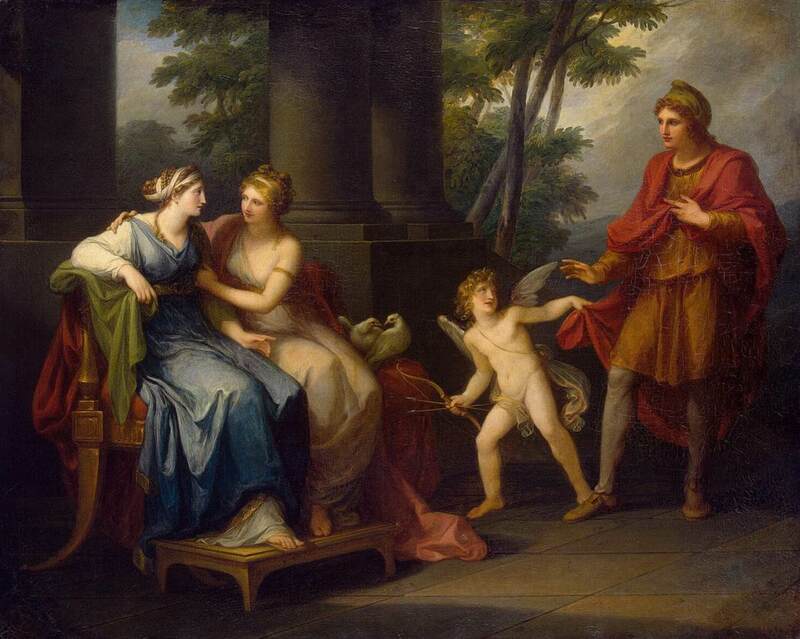 Instead of the many depictions in art that show women in helpless or subordinate positions, Kauffmann advertises “publicly her ability as an individual to choose.”2 Another painting by Kauffmann also hints at this same topic of female choice and empowerment: Venus Induces Helen to Fall in Love with Paris (1790, shown right) shows Helen contemplating the decision to fall in love. For Helen, love seems to be a conscientious choice and she has the ability to make that choice. What a dramatic departure this is from depictions of swooning women in art (see here and here and here), who are rendered as helpless subjects! Do you know of other examples in art where a female figure is represented with agency or ability to choose? Or, do you know of any other examples of swooning and/or helpless women? 1 Frances A. Gerard, Angelica Kauffmann: A Biography (London: Ward and Downey, 1893), 18-21. Available online here. Gerard relates that a handsome, promising (male) musician was one of the individuals who actively tried to convince Kauffmann to study music. It is related that Kauffmann’s depiction of Orpheus in Orpheus Leading Eurydice out of Hades (located in a private collection) is a portrait of the handsome musician. 2 David G. Wilkins, Bernard Schultz, Katheryn M. Linduff, Art Past Art Present, 6th edition, (Upper Saddle River, New Jersey: Prentice Hall, 2009), 406. Strawberries as an "Earthly Delight"
I’ve been thinking about Hieronymous Bosch and The Garden of Earthly Delights (c. 1510-1515) quite a bit this week. In fact, this afternoon I sat down to write a post about how Bosch’s “tree-man” (located in the center of the panel which depicts Hell) is believed by some to be a self-portrait of the artist.1 But, I’m not going to write on that. At least not right now. 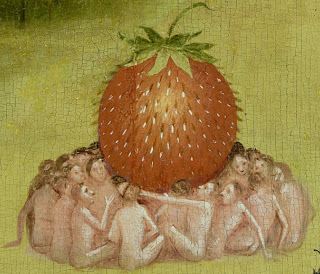 Instead, I’ve become pleasantly distracted by Walter S. Gibson’s article, “The Strawberries of Hieronymous Bosch.” These strawberries appear all over the central panel of The Garden of Earthly Delights altarpiece (see details on right and below). 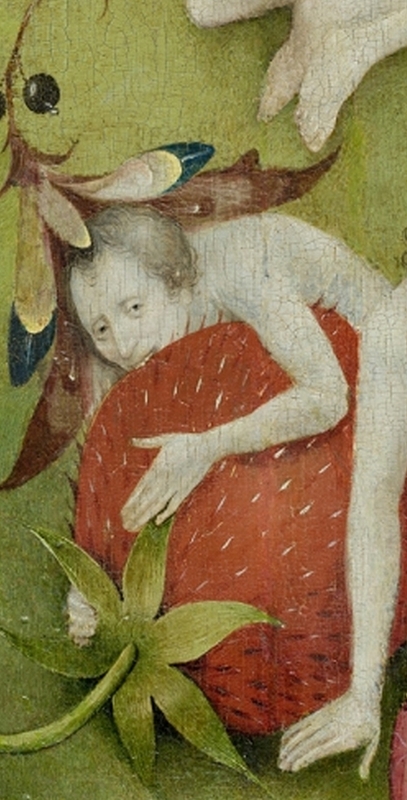 Gibson notes that Bosch’s strawberries garnered attention from viewers very early on. In fact, in 1593 an inventory for some of Philip II’s pictures mentions that the altarpiece had earned the nickname the Madroño (or “the Strawberry”).2 Twelve years later a librarian at El Escorial, Philip’s monastery-palace, explained that the panel is “of the vanity and glory and the passing taste of strawberries or the strawberry plant and its pleasant odor that is hardly remembered once it has passed.”3 This librarian, named Fray José de Sigüenza, felt that the strawberry was the most important feature of Bosch’s garden, and was the fruit was a symbol of the ephemeral, transient nature of earthly pleasures. Many symbolic interpretations for the strawberries have been put forward, and most of them have negative connotations.4 For example, strawberries have multiple seeds, which could hint at promiscuity.5 The other fruit included in the central panel (such as the big raspberries) could also be associated with promiscuity for this same reason. 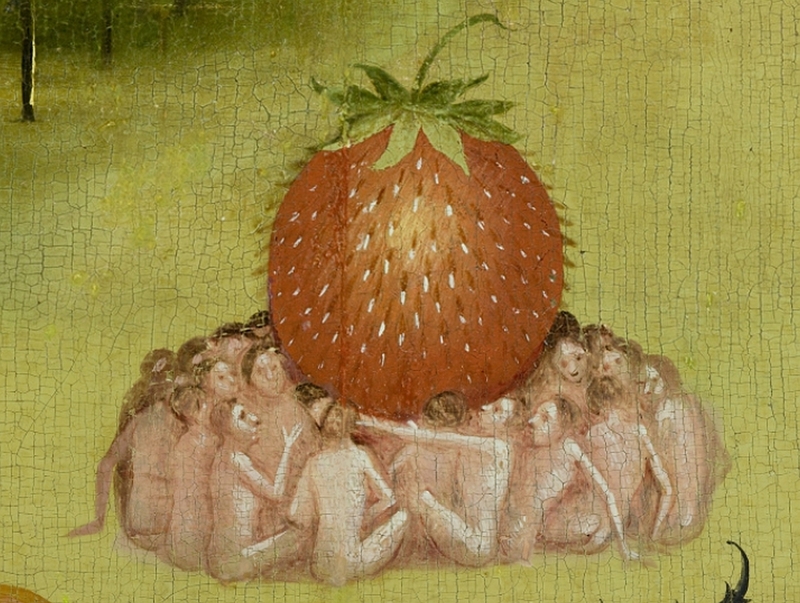 Gibson suggests that the strawberry imagery might connected to a text by Virgil (which probably would have been familiar to Bosch and Hendrik III because Virgil’s passage is referenced in Roman de la Rose, a popular poem in the Burgundian court). In this text, Virgil warns children to not gather strawberries, because “the cold, evil serpent” is hiding the grass nearby. 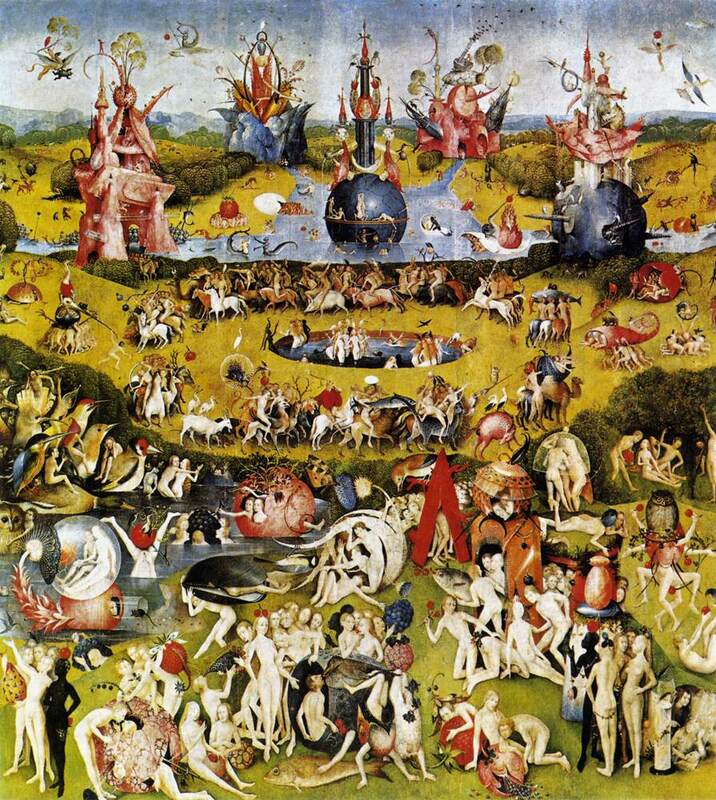 It seems to me that Bosch’s strawberries could serve as an indirect reference to a serpent (and, by extension, the Fall and sin). 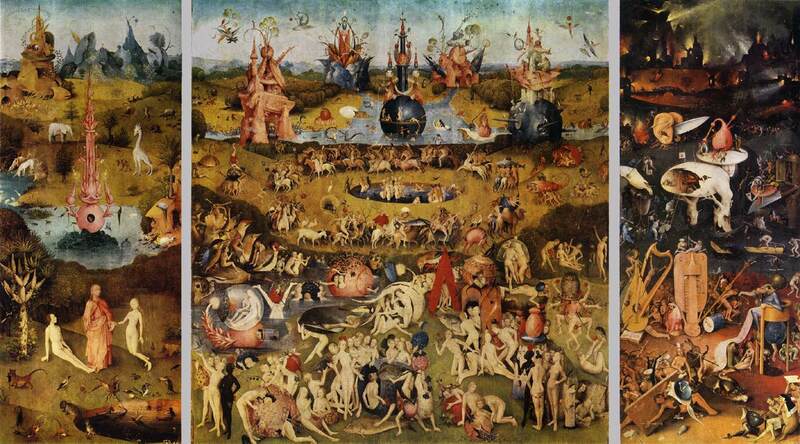 Such associations fit well with the imagery for The Garden of Earthly Delights, don’t you think? That being said, I also think that there isn’t just one specific symbolic meaning for these strawberries. 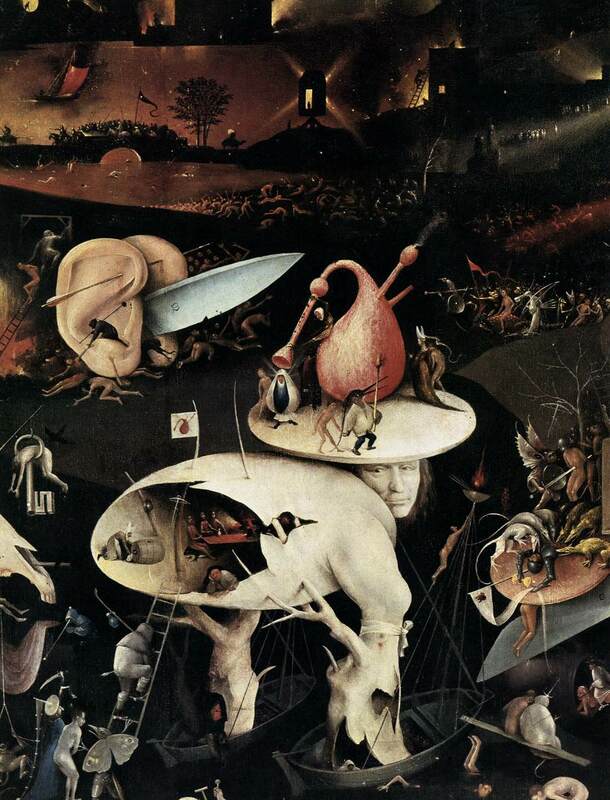 Since this altarpiece undoubtedly served as a focus for intellectual discussion, it is appropriate that Bosch used imagery that was replete with symbolic associations. Do you know of any other interpretations for the strawberries in this altarpiece? Do you know of any works of art which also include strawberries for symbolic reasons? On a fun side note, I found an amusing comparison between Katy Perry and Bosch’s fruit here. No doubt that Perry would view Bosch’s strawberries as a symbol of sexuality! 1 David G. Wilkins, Bernard Schultz, Katheryn M. Linduff, Art Past Art Present, 6th edition, (Upper Saddle River, New Jersey: Prentice Hall, 2009), 327. 2 Walter S. Gibson, “The Strawberries of Hieronymous Bosch,” in Cleveland Studies in the History of Art 8 (2003): 25. 4 There are some positive interpretations of the strawberry which exist. In fact, Gibson points out that the strawberry was seen a medieval symbol of the Virgin. Such exalted associations with the fruit have led a handful of individuals to interpret Bosch’s central panel as a scene of transcendent bliss and spiritual love. For a brief synopsis of these interpretations, see Gibson, 26-27.